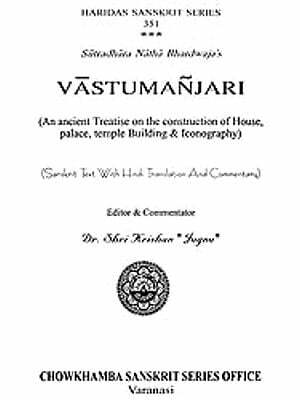 This treatise is one of the early attempts by an archaeologist of our country for a diligent search into the origin, descriptions, symbols, mythological background, meaning and moral aims of Hindu images. The book is in two volumes, each volume again in two parts. Vol. I, Part I contains a long Introduction discussing among other things the origin of Hindu image worship in India, explanatory description of the terms employed in the work, Ganapati, Visnu and his major and minor avataras and manifestations, Garuda and Ayudha-Purushas or personified images of the weapons and emblems held by gods. Vol. I, Part II deals with Aditya and Nava Grahas (nine planets) and their symbolic features and images worshipped, Devi (Goddesses), Parivara-devatas, and measurement of proportions in images Vol. 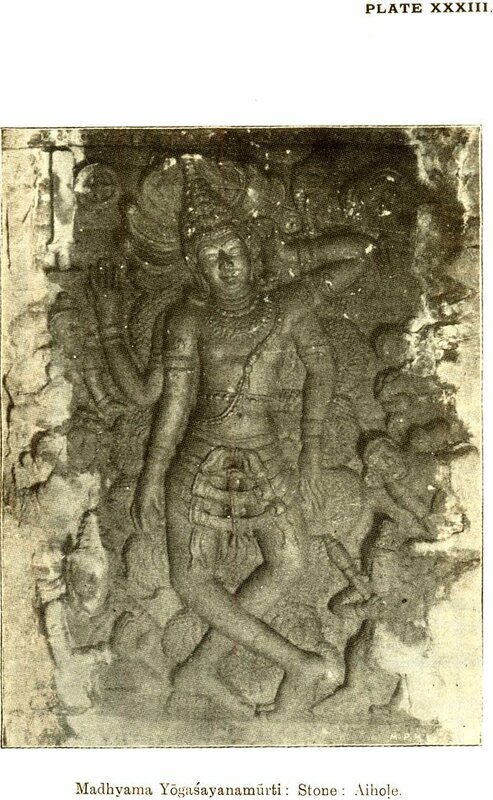 II, Part I begins with an Introduction discussing the cult of Siva which is followed by such important topics as Siva, Lingas, Lingodbhavamurti, Chandrasekharamurti, Pasupatamurti and Raudrapasupatamurti, other Ugra forms of Siva, Dakshinamurti, Kankalamurti and Bhikshatanamurti. and other important aspects of Siva. Vol. 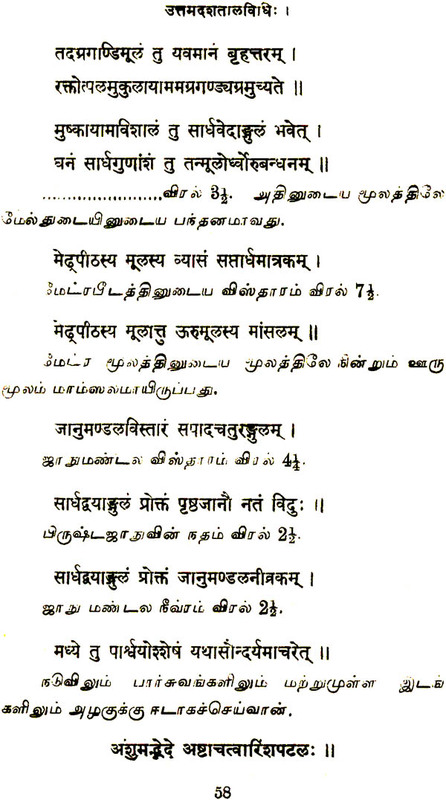 II, Part II contains descriptions of Subrahmanya, Nandikesvara and Adhikaranandi, Chandesvara, Bhaktas, Arya or Hariharaputra, Kshetrapalas, Brahma, the Dikpalakas, and demi-gods. In addition the book contains 5 Appendices, three in Vol. I, Part II and two in Vol. 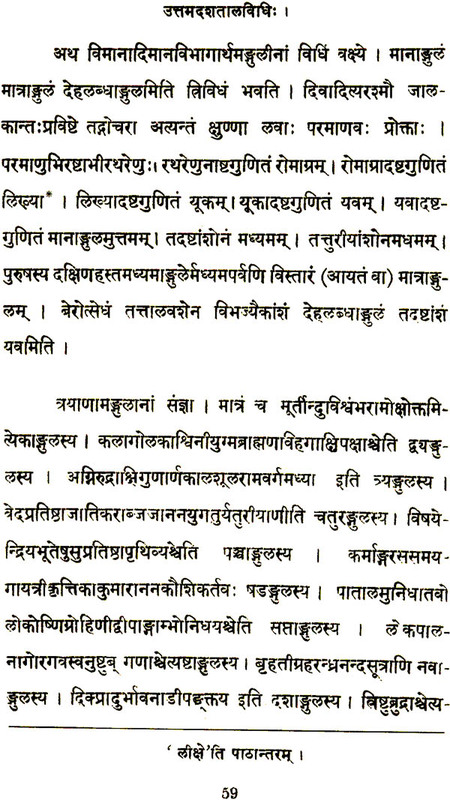 II, Part II, including Sanskrit texts of Parivaradevatah, Uttamadasatalavidhih and Pratimalaksanani. The treatment has been made interesting by profuse illustrations, the two volumes containing as many as 282 photographs of sacred images. THE tall spire of the Hindu temple is one of the first objects to arrest the attention of the observant foreigner and excite his curiosity as he travels through India. On going into the temple, he meets with a number of what may perhaps appear to him to be grim and meaningless images, in stone and bronze and other materials, some with two, others with four or more arms, holding a variety of weapons and other more or less curious articles in their hands. The man on the spot may tell him on enquiry that one of those images is the figure of Vishnu, the god of protection, another that of Siva, the god of destruction, and so on, about the innumerable gods and goddesses comprised within the tolerant and all-inclusive fold of the Hindu religion. Some such foreigner, more curious than others of his kind, is sometimes tempted to study these images somewhat carefully, find out their number and characteristics, and gather the legends relating to them from the Puranas and other sources, as also from the learned natives of the oountry well versed in their religious and mythological lore. Then at last he may come out with his volume on the Hindu gods, on Hindu mythology and other kindred subjects. Such in fact are most of the books that have been written hitherto by foreign authors on topics relating to Hindu Iconography. It is exactly two hundred years since Ziegen- balg, the famous Danish missionary of Tranquebar, wrote his work on the "Genealogy of the South Indian Gods," with the aid of the information he gathered from some people of the Tamil land. In the year 1785 the book known as "Sketches of the Mythology and Customs of the Hindus" was brought out by George Foster. Moore's" Hindu Pantheon ", with illustrations, was first printed in 1810, and then reprinted by Messrs. Higginbotham & Co., of Madras, in 1864, with notes from the pen of the Rev. W.O. Simpson. "Anoient and Hindu Mythology", a work written sympathetically and in defence of the views of the Hindus, with a large number of extracts from the Puranas and other Hindu scriptural souroes, was thereafter brought out by Col. Vans Kennedy in 1831. Another work named "A Classical Dictionary of Hindu Mytho- logy" was published by John Dowson in 1879. 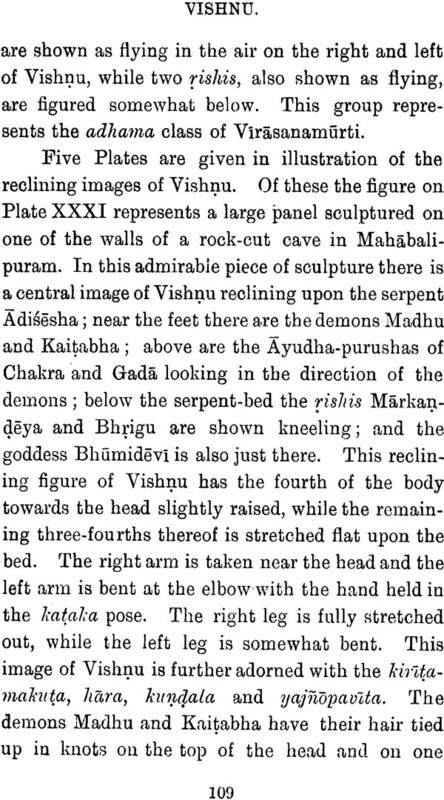 The last among such works is W. J. Wilkins' " Hindu Mythology", illustrated with pictures, and explained with reference to the Puranas and other religious writings of the Hindus. It will thus be seen that books dealing with. Hindu images and Hindu mythology are not alto- gether wanting. Nevertheless, Fergusson, who is an eminent authority on Eastern and Indian architec- ture, has justly remarked-" Whenever anyone "will seriously undertake to write the history of "sculpture in India, he will find the materials " abundant and the sequence by no means difficult " to follow; but, with regard to mythology, the case " is different. It cannot, however, be said that the " materials are not abundant for this branch of the " enquiry also; but they are of much less tangible or " satisfactory nature, and have become so entangled, " that it is extremely difficult to obtain any clear , ideas regarding them; and it is to be feared they " must remain so, until those who investigate the subject will condescend to study the architecture " and sculpture of the country as well as its books. " The latter contain a good deal, but they do not "contain all the information available on the " subject; and they require to be steadied and con- "firmed by what is built or carved, which alone can " give precision and substance to what is written ..... " It is remarkable that, with all the present day " activity in every branch of Sanskrit research, so "very little has been done for the illustration of " mythology, which is so intimately connected with " the whole literature. It would be a legitimate part "of the duty of the Archaeological Surveys to collect " materials on a systematic plan for this object; " and the production of illustrations has now become " so easy and inexpensive that photographs from " original materials of a satisfactory class might "readily be published to supply this most pressing " desideratum. The details of the emblems and "symbols of the numerous divinities of the " pantheon could also be collected, along with the " delineations, by those familiar with such symbols. " All this could easily be accomplished, and it is " consequently hoped it may before long be " attempted." 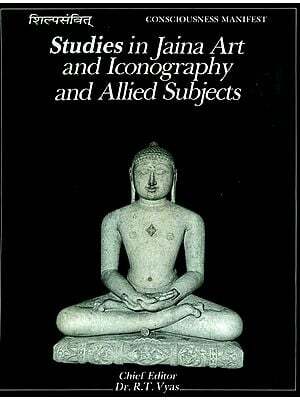 It has to be said that the books by European authors referred to above do not contain the infor- mation, which is available in indigenous Sanskrit works on Iconography; nor do they give pictorial representations of the sculptures that are actually found in this vast country. On the other hand, Borne of those authors have given what might be well understood to be their own version of Hindu mythology, and in their descriptions of Hindu images, with here and there a pungent remark about what they consider an uncouth repre- sentation or an immoral legend, they seem to have cared to study neither the symbolism underlying the mythical stories nor the meaning of the images illustrating them. A book on the model suggested by Fergusson has indeed been a great desideratum. THE origin of image worship in India appears to be very ancient and its causes are not exactly known. Many believe it to be the result of the followers of Gautama Buddha adoring their master and worshipping him in the form of images on his apotheosis after death. However, there are indi- cations of the prevalence of image worship among the Hindus long before the time of Gautama Buddha. The employment of an external object to concentrate the mind upon in the act of medi- tation in carrying on the practice of Yoga is in India quite as old as Yoga itself. Patanjali defines dharana or fixity of attention as "the process of fixing the mind on some object well defined in space." This process is, as he says, "of two kinds, in consequence of this defined space being internal or external. The external object, defined in space consists of the circle of the navel (the nabhi-chakra), the heart and so on. The fixing the mind thereon is merely directing its existence to be there." There is indeed ample evidence to show that the practice of Yoga is in this country much older than the time of Patanjali, Vachas- pati Misra, a commentator on Vyasadeva's Bhashya on Patanjali's Yoga-Sutras, mentions a great sage Hiranyagarbha as the founder of the Yoga doctrine, which, he adds, was simply improved upon and promulgated by Patanjali, as evidenced by the use of the word anusasanam. in Patanjali's first aphorism Atha yoganusasanam. This old sage Hiranyagarbha and his successor Varshaganya Yajnavalkya are alluded to by Ramanuja and other later teachers of Vedanta; and Sankara actually quotes some Yoga aphorisms which are not found in the work of Patanjali, but look older than his time. 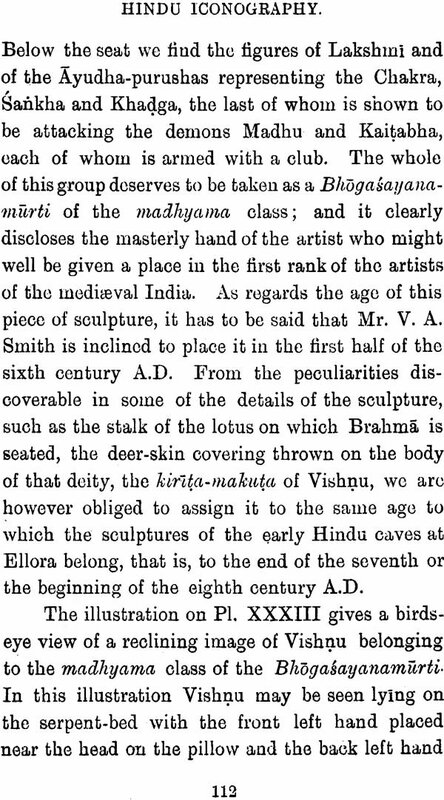 It is therefore clear that image worship among the Hindus was contemporaneous with, if not older than, the development of the Yoga system, which, as we have seen, dates from before the age of Patanjali, who has been assigned by scholars on good evidence to the second century before Christ. There is no doubt that the Yoga system is even older than the time of Buddha, because Buddha himself is declared to have been initiated into its practice in the earlier stages of his search after enlightenment and truth; and it may be taken that this fact is evidenced by sculp- tured representations of Buddha in the style of the Gandhara school as an emaciated person almost dying under the stress of the austerities he prac- tised. Again, Panini, to whom certain Orientalists assign a date somewhere about the sixth century before Christ, mentions in one of his grammatical aphorisms (v. 3,99) that "likenesses not to be sold but used for the purpose of livelihood do not take the termination kan:" The word he uses to denote an image in a nearly preceding (v. 6, 96) aphorism is Pratikriti, the literal meaning whereof is any- thing made after an original. Commentators on this aphorism understand these unsellable reproduc- tions to be divine images. Evidently then, there were images of gods and goddesses in the days of Panini, which were apparently not sold in the bazaars, but were, nevertheless, used for the purpose of making a living. This would indicate that the possessors of these images were able to utilise them as religious objects which were so sacred as to justify the gift of alms to those who owned and exhibited them. 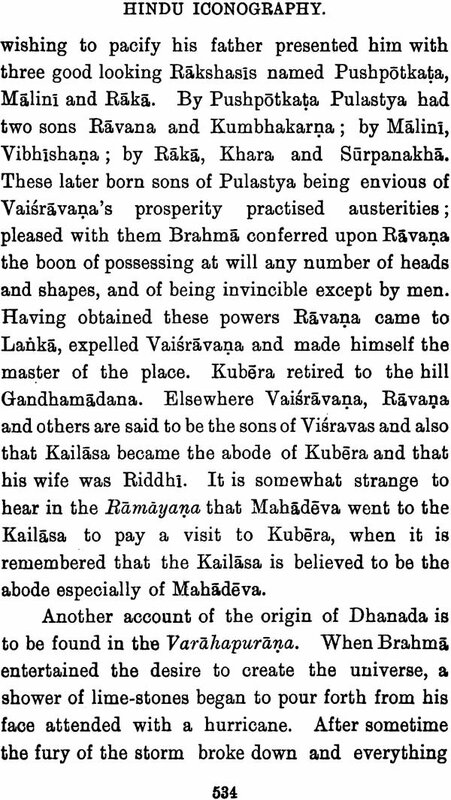 Finally, images of gods, as they laugh, cry, sing, dance, perspire, crack and so forth are mentioned in the Adbhuia-Bralimana, which is the last of the six chapters of the Shadvimsa- Brahmama, a supplement to the Panchavimsa- Brahmana. As regards the existence or otherwise of image worship in the Vedic period in the history of India, opinion is divided among European savants. Prof. Max Muller, (Ohips from a German Workshop, I. 35), answers the question, ' Did the Vedic Indians make images of their gods,' in the negative. He says, "The religion of the Veda knows no idols. The worship of idols in India is a secondary forma- tion, a later degeneration of the more primitive worship of the ideal gods." On the other hand Dr. Bollenson finds in the hymns clear references to images of the gods, (Journ. of the Germ. Orient. Soc. xxii, 587, ff). "From the common appellation of the gods as divo naras, 'men of the sky', or simply naras (later ? 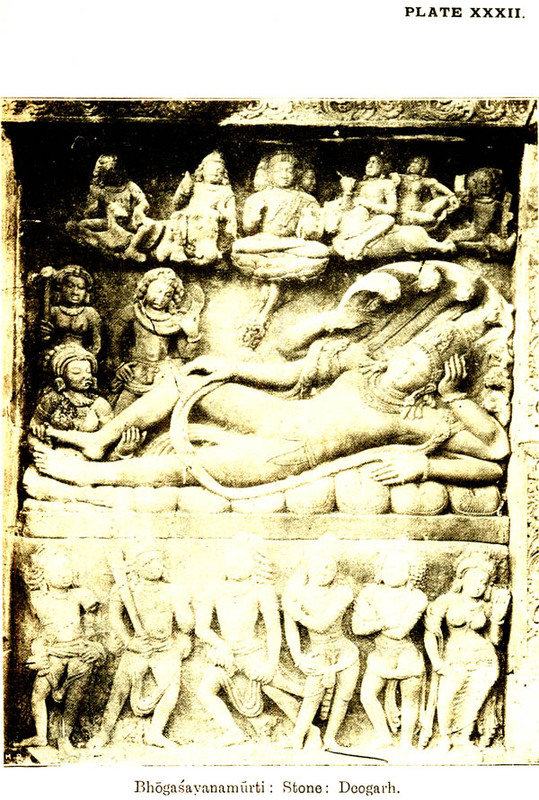 ), 'men' and from the epithet nripesas, 'having the form of men', R. V. iii, 4, 5 we may conclude that the Indians did not merely in imagination assign human forms to their gods, but also represented them in a sensible manner." Image worship seems to have become common in the time of Yaska. In his Nirukta he says, " We are now to consider the forms of the gods. One mode of representation in the hymn makes them resemble men; for, they are praised and addressed as intelligent beings. They are also celebrated with limbs such as those of men." 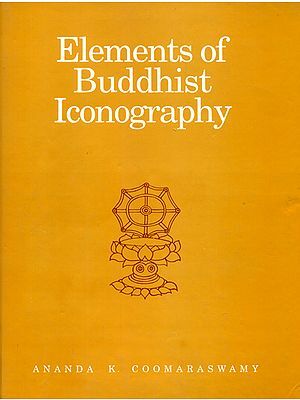 IN bringing out the Second Volume of the Elements of Hindu Iconography, the author earnestly trusts that it will meet with the same favourable reception that was uniformly accorded to the first volume both by savants and the Press, for which he begs to take this opportunity of ten- dering his heart-felt thanks. No pains have of course been spared to make the present publication as informing and interesting as is possible in the case of the abstruse subject of Iconography. Though the illustrations appearing in the present volume are by no means inadequate for the main purpose of the work, yet they are not so full and exhaustive as in the first, and a word of explana- tion in that connection may not be out of place. To the great regret of the author, the liberal pecuniary help offered for the preparation and publication of the first volume has been, owing to the somewhat straitened finances of the Travancore State at present, withheld from him on the present occasion and he has, in consequence, not been able to embody as many illustrations as he had intended personally to gather for the purpose from various parts of India with a view to present to the public a series representative of the varied sculpture of the different parts of this country But the Travancore Durbar have, in gracious consideration of the trouble and labour involved in the prepara- tion of the present volume, been pleased to permit its publication by the author himself, for which he begs to offer his respectful and grateful thanks to the Dewan, Mr. Dewan Bahadur M. Krishna Nair, B.A., B.L. Mention may here be made of a few points worthy of notice in the book. In the Introduction is given a collective description of all the peculiari- ties of the tenets and observances of some of the Saiva sects of which the general public has hitherto been practically ignorant, and of certain other cults that have died out without a trace. The nature of Linga worship has been ex- amined critically in the light of original texts gathered from such important sources as the Saivagamas, Saiva philosophical treatises, Pursnas and Itihasas, and with reference to the extant sculpture of all ages of this symbol of worship, and the matter has been thoroughly discussed and, what the author ventures to claim to be, an impartial conclusion arrived at. In the body of the book, several matters, which will be seen to be quite new even to the informed Hindu, have been dealt with; to cite an instance, everybody knows that Siva begged for food with the broken skull of Brahms as an expiation for the sin of having cut off one of Brahma's heads, but it is doubtful if it is known why this curious sort of penance should have been resorted to by Siva to get rid of His sin. Again, it has been found possible with the help of the knowledge derived from a close study of the bulk of the science of Natya-Sastra together with commentaries thereon to elaborate and treat fully the manifold dances of Siva, though only eight or nine modes are described in the agamic and other works. The reader will, it is hoped, come across many other instances of fresh information being furnished on matters that have remained more or less obscure hitherto. The author cannot be too thankful to the Proprietors of the Law Printing House for the extraordinary care and trouble they have bestowed upon the printing and general get up of the books and for their readiness in coming forward and generously offering their timely help but for which the volume could not have been brought out. The author cannot also omit to express his sense of gratitude to Dr. A. K. Anandakumaraswami, M.A., D. Sc., for the ready and willing permission granted to him for reproducing the valuable article on the dance of Siva, contributed some time ago to the Siddhanta- Dipika by the learned Doctor. He has also very great pleasure in recording here his high appreciation of the help cheerfully rendered by his Pandit Mr. V. Srinivasa Sastri, Smritivisarada, but for whose untiring industry and intelligent collaboration this work could not have been brought to a successful completion so soon. Messrs. Long- hurst, Stoney, Kay and Beardsell, have been so very kind as to assist the author with photographs of images in their respective collections and to accord. their gracious permission to reproduce them: to these gentlemen, the author offers his grateful thanks. For reasons which need not be explained here, it was not possible for the author personally to super- vise the printing of the work throughout so as to ensure the presentation of an absolutely correct text; he had therefore to entrust the task to the printers themselves. In spite of the care and trouble ungrndgingly bestowed by them in the midst of their multifarious duties, a number of errors have unavoidably crept in. Though such of them as have been subsequently noticed are noted in the errata list, it is likely many more have escaped detection, for which the author craves the indulgence of his readers. ONE of the oldest as also the most widely spread cult in India is that of Siva. It consisted once of several sects, of which only a few have survived to the present day. Some of them had the sanction of the Vedas while others were classed as outside the Vedas or as opposed to them; again, some of them had milder forms of worship, while others practised horrible and shocking rites. The ideas about life, action and liberation differed from sect to sect. It will not be without interest to examine in some detail the history, the main tenets and the ceremonies of a few of the leading sects of Siva in the following paragraphs. First, as regards the origin of the sects classed as outside the pale of the Vedas, the following account taken horn the Varaha-purana. will be of interest. In the forest of Dandaka situated in the middle of Bharatavarsha, the rishi Gautama had his asrama (hermitage), round which, he had abundant food-giving plants and trees. There once raged a twelve years' famine during which a number of rishie from various other asramas flocked to that of Gautama for food and shelter, and were received with all kindness and treated with great hospitality by Gautama. After the famine abated and the country became again fertile, the rishis desired to start out on a pilgrimage to the several famous tirthas ; one of the rishis named Maricha, thinking that they should not leave the asrama without informing Gautama, but fearing at the same time that he might, in his extreme kindness and hospitality, refuse permission for the pilgrimage, created from maya an enfeebled, old cow and let it graze near Gautama's asrama. Gautama went near the cow to water' it; as he went near the cow, it fell down and died. The ungrateful rishis attributed to Gautama, the sin of killing a cow and refused to stay any longer in the abode of such a sinful one. Gautama, who did not know this trick of the rishis, really believed that he had committed the sin and asked them how he could raise the cow from death. Advising him to sprinkle on it water brought from the Ganges, they departed on their projected pilgrimage. Gautama repaired to the Himalaya and prayed to Siva a hundred years and got from his jatamandala a small quantity of the water of the Ganga which he sprinkled on the dead cow. The water of this divine river revived the cow and itself began to flow as the river Godavari. Gautama at last perceived through his mind's eye that the death of the cow and other incidents connected therewith were a clear deceit practised on him by the rishis and cursed them to become Vedabahyas or those outside the pale of the Vedic religion. On their entreaty to abate his anger against them, he was pleased to assure them that though they were outside the Vedic cult, they would rise to heaven through bhakti or devotional love of God. The fallen rishis went to Kailasa and prayed to Siva to grant them some sastras which had a few Vedic rites at least. Thereupon, the rishis were decreed to be born to the Raudras, the lovers of spirituous liquors and flesh, who sprang up from the sweat- drops which flowed from Siva while he was in the aspect of Bhairava, and to these he gave the Pasupata Sastra. From the above account one fact becomes clear, namely, that some at least of the followers of the Pasupata and other non-Vedic sects were at first followers of the Vedic religion and gave it up and joined the avaidika cults. 'That the Pasupata and a few other sects are indeed very ancient may be inferred from ancient authorities. The Atharva- siras Upanishad describes the Pasupata rite thus: " This is the Pasupata rite: ‘Agni is ashes, Vayu is ashes, water is ashes, dry land is ashes, the sky is ashes, all this is ashes, the mind, these eyes are ashes: Having taken ashes while pronouncing these preceding words, and rubbing himself, let a man toueh his limbs. This is the Pasupata rite, for the removal of the animal bonds." Again the Bhtta linga and the Gudimallam linga bear clear sculptural evidence of the antiquity of the Saiva cults. From the summary of the philosophy of a few of the important Saiva sects given below it would be clear that they have played a prominent part in the Religious History of India.